Even with all the improvements in cellular technology I still run into areas which have very poor cell phone service. There are the times when I’m the passenger in a car and the cell phone quality just gets worse and worse. Does this ever happen to you? You’re talking on the phone and the quality of the call keeps decreasing. You keep waiting for your call to switch to the next cell tower but that never seems to happen. What should you do? We used to drive up and over a section of the highway that we dubbed “The Hill of Cellular Death”. It was pretty much guaranteed that when you got about two-thirds of the way up the hill on either side, your cell call would drop. It got to be that I wouldn’t even answer my cell phone when the vehicle I was traveling in was within a half mile of that hill. Thankfully they now have a low profile tower on that hill and my calls don’t get dropped anymore. What should you do when your smartphone gets really poor cell phone service? This is what that pesky “Airplane Mode” button is for! 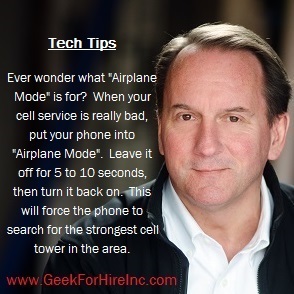 Put your phone into “Airplane Mode” so that it turns off your cell service, your WiFi, and your Bluetooth. Leave it off for about five to ten seconds and then turn it back on. This will force the phone to search for the strongest cell tower in the area. Here’s a blog I wrote explaining what 4G service is. Here’s another blog with locations for decent cell service along the Peak to Peak Highway. Please forward this to your friends who complain about their poor cell phone service. Chris Eddy of Geek For Hire, Inc. has been providing computer service to families and small businesses with Mac’s and PCs for the past eighteen years. Angie’s List and the BBB rate Geek For Hire very highly. You can find more on our website, or give us a call 303-618-0154. Geek For Hire, Inc. provides onsite service (Tier 3) to the Denver / Boulder / Front Range area as well as remote service throughout North America. 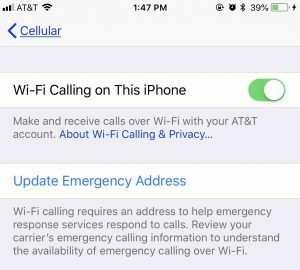 Did you know that you can use WiFi calling to make phone calls with your SmartPhone even when there is no cellular service available? But even if you don’t have friends with sparse or non-existent cell service, you still want to know about WiFi calling. We’ve all gone to that coffee shop with lots of brick and metal and maybe one bar of cell service. Or that place in the shopping center whose entrance faces north, AWAY from all the cell towers. Or, true story, the wind blows down the primary cell tower at your house and it takes them three months to put it back up. Where ever you have WiFi, you can continue to make phone calls. How do I turn on WiFi Calling? 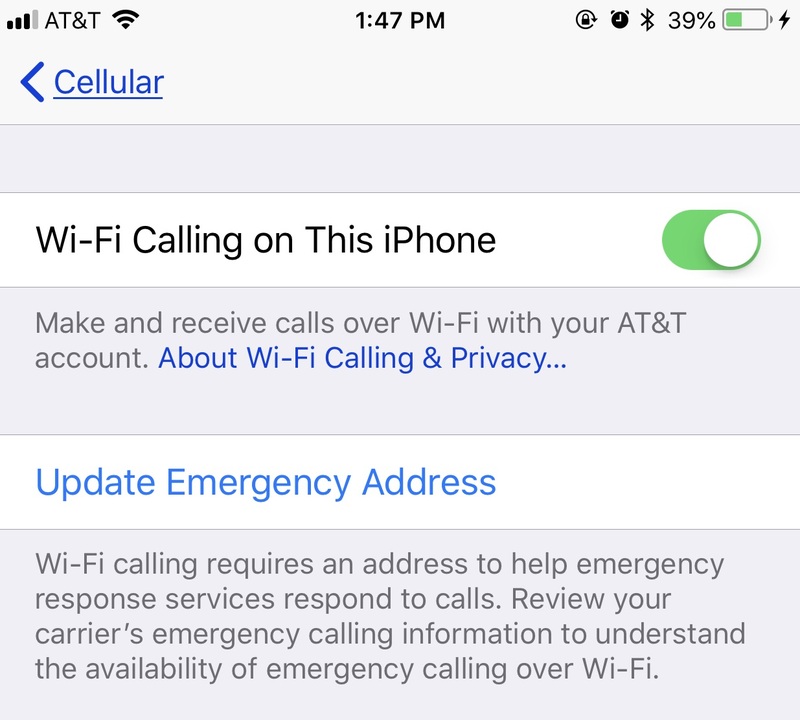 On your iPhone, head over to Settings -> Cellular -> WiFi Calling -> then toggle the button to “on”. On an Android, tap on Settings, then “Networks”, and then “Call”. You can turn on WiFi calling from there. I wouldn’t recommend updating your Emergency Address unless you ONLY use WiFi at home.